Family Portraits: A Story of You. There are so many places to take photos in Toronto that I do not even know where to begin! The city is so full of hustle and bustle -- truly, it never sleeps! Some Toronto wedding venues allow couples to use the property for their portraits only if they are actually being married there. Other venues are public access, and others have a permit policy, making couples pay a fee to "rent" access to the space for a designated length of time. The Old Mill wedding venue falls into the first category, permitting access to those being married there. 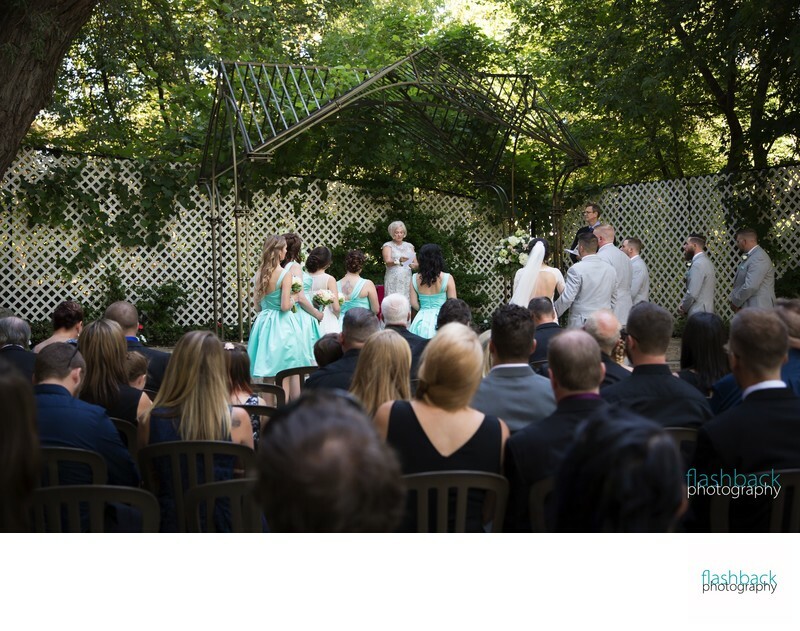 The Wedding Garden is one of the most popular places on the premise simply because it is so atypical for Toronto. We think of Toronto as being a "grey" city -- grey roads, grey sidewalks and a shiny urban landscape of concrete and windows. The Old Mill Inn and spa wedding venue is the exception, with lush natural surroundings, yet still a central location right off several main routes. I love the wrought-iron gazebo with its open-air roof that lets the blue sky fill the "ceiling". Also, the white lattice backdrops give a subtle elegance to the space while providing very important privacy screening. Guests and the wedding party enter from a long set of staircases, for a very dramatic first view down the aisle. In this image of the ceremony I included some the guests in the foreground, taking an less conventional angle than the one down the aisle. I love capturing the scene from the perspective of the family and friends viewing simply because the bride and groom never had the opportunity to see their own event from this angle. Finding creative ways to photograph a wedding, especially at a venue I work regularly, is one of the most important roles of a professional. Capturing the scene entirely means being a complete set of eyes, seeing the whole thing at once. It means being in the right place when the father shakes his son-in-law's hand. It means being there for the ring bearer to hand over his precious charge. It means being present in a way that is incredibly unobtrusive to the day, and yet is very prominent. Needless to say, this is not an easy feat! The Old Mill is the perfect venue to help me get interesting vantage points because the Wedding Garden is at a lower elevation that the main entrance, allowing me to run around the building to the front door, then look down on the ceremony below. Also, I can sneak up the main aisle easily because there is so much depth to the space, with the guests up close to the action and plenty of room unoccupied behind them. Location: Old Mill Inn and Spa, 21 Old Mill Rd, Etobicoke, ON M8X 1G5.